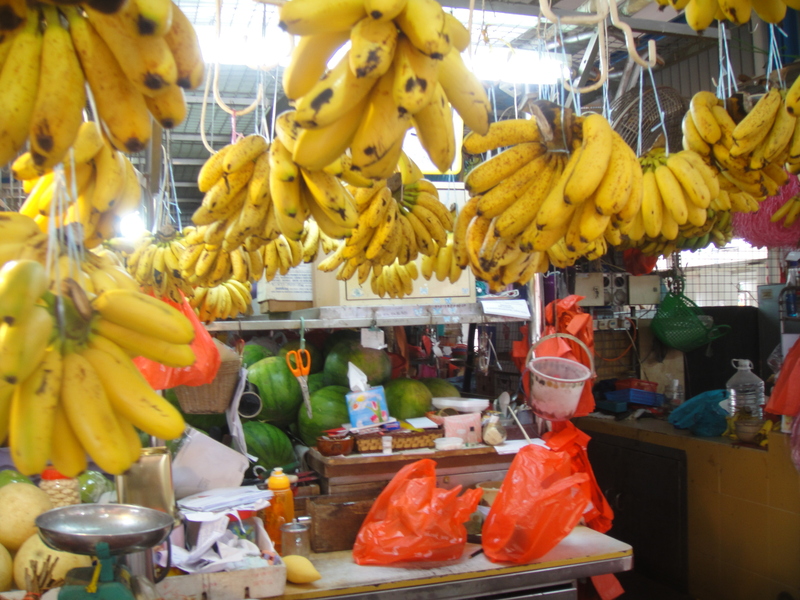 Posted on September 18, 2013 by Veena S.
Living in Singapore for over ten years and doing my weekly grocery shopping at the ever popular Wet markets was a great way to understand the local life. I gradually became accustomed to the sights, smells, often covering my nose with my saree pallu and gawking at local accents. For a tourist, sight seeing cannot be complete without a visit to the heartlands of Singapore where the locals live in HDB’s and shop or eat the Wet markets. Why are they called Wet markets, I wondered on my first visit? Aha..a part of the market is dedicated to fresh produce and the other part to meat, fish and poultry. 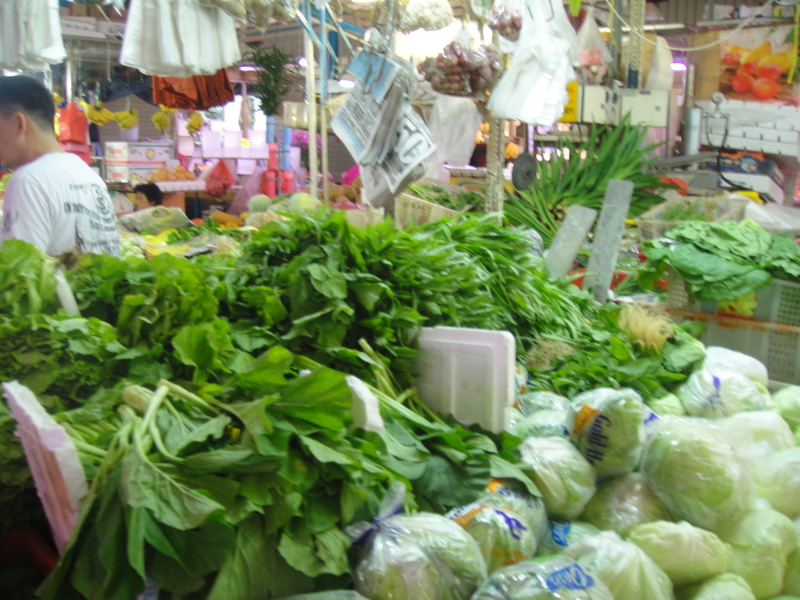 Singapore being a hot and humid, typical tropical country – vendors need to use ice liberally, that melts and drips onto the floor of the market, hence making it wet and retaining freshness. The dry area has numerous stalls of leafy greens, exotic local fruit like Rambutaan, Chikoo, Durian and other stalls selling vegetables. The Wet markets are covered markets, well constructed by the Municipal body. They operate from early morning 6:00 am till noon. ‘Lai lai-lai’ shouted the cart pusher, move away he instructed with hand admonishes, as I carefully stepped across the wet, slippery floors at Bedok market. ‘Eeeks, what a strong smell’ I muttered, covering my nose and holding my breath. The smell of meat and fish are enough to chase away even a connoisseur ! Roasted pigs were displayed hung upside down, a favourite food of the local Chinese! Being a vegetarian, this part of the market was CERTAINLY not my cup of tea! That made me find the ‘other’ entry point for the market – straight onto the stalls selling fruit and vegetables. Luckily, I could see bananas hanging in big bunches at other end. That raised my spirits to continue shopping and exploring for the exotic tropical fruit, fresh of the season. Red juicy watermelons, prickly skinned jackfruit that yielded fleshy, strong smelling pods with a large seed inside, small red lychee that oozed out sweet juicy flesh, ripe brown chikoo fruit…..yummm. This was a feast! Now, Singapore has a rich and robust economy, despite its small size and the majority are Chinese. The other minorities are Malay, Indians and Eurasians. Thus these markets cater to all cuisines and cultures. Have you heard of the 5 Cs of Singapore? The well to do and hard working Chinese community yearn to have all the 5 C’s – these are: Cash, Car, Condominium, Credit Card and Club membership. Today, as I shop, let me try to replace them, exploring what C’s means at the market. Chinese motto for life: work hard, be rich, buy expensive! Wet markets open as early as 4 am every day. The big holiday is only during Chinese New Year. As I sampled fresh leafy greens, Chye Sim and baby Kai Lan the hurried stall owner curtly shouted ‘Have money, can buy lah’ telling me not to waste his time if I did not intend buying. Though prices are cheaper than supermarkets, no bargaining – is the policy. ‘No cheap- cheap lah!’ he shouts to another customer sending a strong message of no bargains! ‘I go Austraalia for holiday. I need maaney (money) to pay rent’ with his strong Singaporean accent. ‘Wow! such ambitious dreams for a vegetable vendor!’ I thought to myself. The national population is mainly Chinese and I can see many stall owners that are Chinese too. The minority of Malays and Tamil Indians make up the other bits of this jig-saw puzzle. Therefore even the stalls catering to their needs are fewer. ‘Is there an Indian stall at the Bedok market?’ I inquire. Indians would prefer vegetables like bitter gourd, drumstick, brinjals, Aarvi, raw banana and coconuts. ‘Not in this market lah!’ replied one Chinese vendor. ‘Go Serangoon, go Little India’ she continued in typical Singlish. This February, with Chinese New Year round the corner, the market was extra vibrant and colourful. Prices of Mandarin oranges and Pomegranate are exchanged during the New Year, thus prices were higher than usual. Even my flower seller raised the price for Chrysanthemum, Marigolds, Carnations and Roses. ‘Red and gold colours are special during the New Year’ she said. To understand the local food and culture it’s time to treat myself to curios, sweet boxes and souvenirs that filled the streets. The dry side of the market was packed on either side with fresh vegetables and flowers. 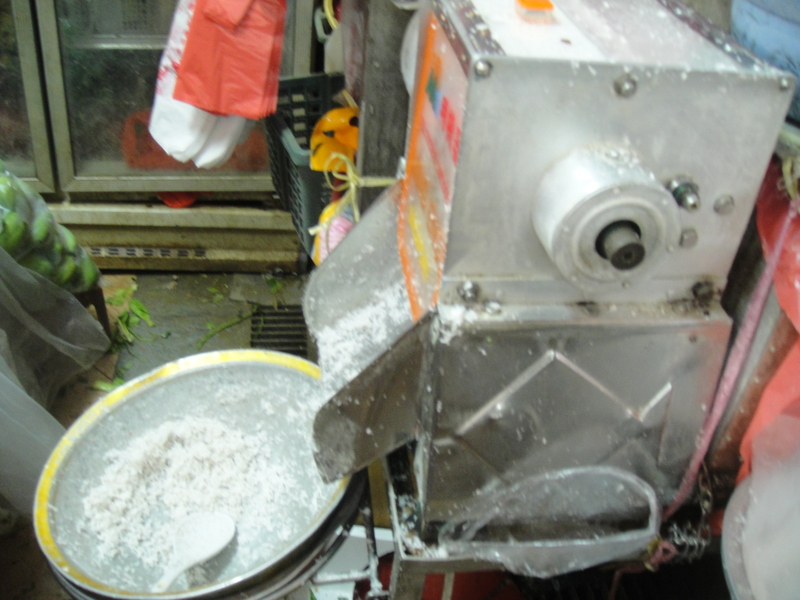 I chanced upon a coconut shredding machine at the Malay stall. How exciting! I chose a big, brown, husky coconut from the container hidden beneath the stall. Coconuts are a popular ingredient in both Malay and Tamil cuisines. This elderly Malay man was dressed in a loose Sarong and black cap. He gently patted the coconut with his knuckles ..‘Tuk, tuk, tuk-tuk.’ That’s the way to check the good flow of water inside. With a smile of satisfaction, he broke the coconut in two and put the tender white pieces into the grinder. ‘Grrr…rrr …he turned on his antique grinding machine. Out spilled white, frothy coconut shavings. ‘Simply sweet and delicious’ I muttered digging into the neat plastic bag full of powdery white shavings. Let me check some Malay gravy recipes that use this soft coconut, I thought. Chinese believe there must be balance and harmony not only in life, but even in food. Chicken rice and pork is Singapore’s most popular food, but Chinese balance meat/pork by munching on fried leafy greens. I pick up some Chye Sim, Cailan, Chinese Broccoli (not the same as Western green flower heads! ), Cabbage, Celery and Chinese bean sprouts. Well, a gourmet cooking time for me ahead I think! Can I find any more C’s while sipping my dark, black Coffee that I bought at the adjacent food court? Coffee is popular drink and is locally called Kopi, served black, but with milk it is called Kopi-O. Yes, spotted one more C : Carrot cake. What a surprise it was that Carrot cake ! Nothing like the rich, moist traditional one filled with tiny orange strands. This Chinese version turned out as a pan-fried, soft layered dumpling. And it was made of radish and plain rice flour. ‘Radish has a homophonic sound for good fortune’ quipped the short Chinese lady at the counter, giving a big grin, because I was her customer. Now I understand why the Chinese eat Carrot cake (Chai Tao Kway – a TeoChew delicacy of steamed Turnip/Radish) during Chinese New Year. It’s all about good fortune and cash rich. Which is better – Supermarket or local Wet market? I once asked an aged local lady. Super market is expensive and you don’t get to interact with the vendors. But as Singapore society is getting richer and women are working longer hours, the traditional good times at fresh markets is becoming rare. They prefer the air-conditioned, clean and efficient service of supermarkets. They even do home delivery. ‘Competition is tough’ cried the grumpy, pot-bellied stall vendor. ‘Government has to help us’ he continued. It’s hilarious to hear the locals speak English, jokingly termed as Singlish (Singaporean English). Well, Cantonese and Mandarin vocabulary and intonations find their way into English. ‘Why pay more lah?’ is another common phrase. ‘Don’t be so kiasu’ which means don’t hoard, be reasonable. The carrot cake vendor asked me Ta Pao (carry away) or eat here? Time to go home after that shopping, so no play –play, which means get serious. As they say in Singlish – So how? What we do now? Hope you have got a fair idea of the local culture and the market sights. Can YOU think of transforming the 5 Cs to your home culture ? Try lah! Veena Tai ….I felt so good walking with you in the Wet Market…..I too feel that visiting the local market does give you a glimpse of the people of that region….keep up the good work and post some more experiences! Thanks – so you did ‘walk to the market’ with me 🙂 I have to yet add my recipe section countrywise. Will do soon. Veena, I am ashamed to admit that I haven’t been to a wet market in Singapore in the past five years that I have been living here!!!! However reading your colourful description has aroused my curiosity and will make it a point to go there one of these days! Thank you so much for your wonderful stories!!! Looking forward to the next one!!! Wonderful ! Even I love to visit the local markets where ever I go. In other Asian countries you are looked upon by the vendors with curiosity,doubt and respect also. It was fun to read your picturesque narration…. Nice write up, while reading i felt like going into those wetmarkets. Few things i have missed out to see. Will notice next time.